Upshaw, a forward on the Grand Rapids Drive team, suddenly dropped to the court on his stomach during a game against the Long Island Nets on Saturday. 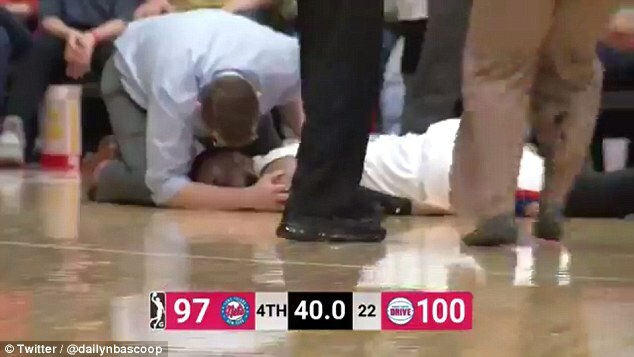 An NBA G League player was hospitalized after collapsing on the court with just seconds of a game left to go on Saturday night. Zeke Upshaw, a forward on the Grand Rapids Drive team, suddenly dropped to the court on his stomach during a game against the Long Island Nets. Upshaw, 26, had to be taken off the court in a stretcher and was rushed to the hospital. A source claims Upshaw was in cardiac arrest and in critical condition, according to Grand Rapids NBC affiliate WOOD-TV. A statement from the team on Sunday only said that Upshaw's condition was 'not immediately known'. Eric Zane, the public address announcer for the Grand Rapids Drive, said he 'immediately knew it was terrible'. Upshaw helped the team earn a playoff spot by scoring 11 points in their 101-99 victory against the Nets at DelaPlex Arena in Walker, Michigan. It will be the first time the franchise makes an appearance in the G League playoffs. Upshaw, who is 6ft 6in, is in his second season with the Drive. He was undrafted after a college career at Illinois State and Hofstra and played overseas until he was picked up by the G league team in 2016. The NBA G League is the NBA's official minor league. More than a quarter of NBA players come from the developmental league.